Wallrock Cosy Liner KV300 is part of the Wallrock Thermal Liner family and made by Erfurt Mav. It has been developed to offer you a more economical package, while still providing many of the same benefits as Wallrock Thermal Liner, though to a lesser degree. 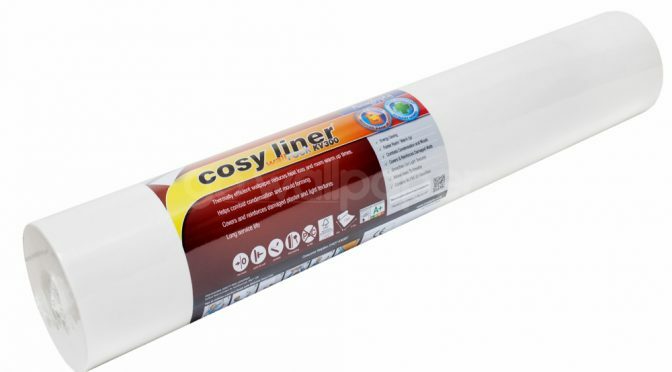 Wallrock Cosy Liner KV300 offers a more modest level of thermal and sound insulation and will provide some of the energy saving properties of Wallrock Thermal Liner. Wallrock Cosy Liner’s main benefits are that it is ideal for covering up problem surfaces such as cracked rendering, wood panelling, bare plasterboard or damaged and rough plaster at a fraction of the cost of Wallrock Thermal Liner. And like all of Erfurt Mav’s Wallrock products, Wallrock Cosy Liner allows walls to breathe which minimises condensation. In addition, Wallrock Cosy Liner is a Paste the Wall product so it is quick and easy to hang, even for beginners. For a completely flawless finish on your walls and ceilings, Go Wallpaper recommends using Wallrock Fibreliner, Wallrock Premium or Wallrock Fibreliner Plus over the top of Wallrock Cosy Liner Liner.